For online tax return preparation, the foremost requisite thing is to apply for a PAN. PAN (Permanent account number) is a 10 digit alphanumeric number allotted by the tax department, used to identify each unique taxpayer and to make interaction with the tax department services online. PAN today is required for almost all financial transactions like for opening a personal/saving/current bank account, to apply for a demat account etc. It is a unique identification number issued by the department to an individual, company, HUF (Hindu Undivided Family ) or any other person as prescribed. 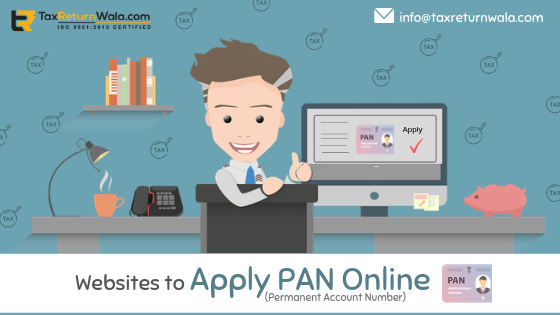 PAN suffices a unique identity to every taxpayer, which also help him to transact on multifarious financial issues and to get assistance from different finance professionals like getting online tax return preparation, GST registration, refund claims from agencies on behalf of the taxpayer and so on. Online new PAN application can be made either from the portal of NSDL or from the portal of UTITSL The charges for application on both may vary. Payment of new PAN application can be made by any of the e-payment forms prescribed. Earlier, a person has to fill an offline form to apply for PAN and then upload it to the department website with all supporting documents. But now it is easy to apply a new PAN with Form 49A available online. Put your ‘surname’ before the ‘first name’ while filing the application form, but the name on the PAN will appear in the right sequence. An online e-KYC and e-sign will be done by putting in the Aadhar details. There is no need to upload an image, signature or any other supporting document, also the photo of your Aadhar will appear in PAN if the e-sign facility is used. Another option to fill all prescribed details without e-sign will also be provided to the applicant. For minor applicants or cases where the representative assessee is appointed, the e-KYC and e-sign facility will be not be provided online. In case of PAN application of HUF, a special declaration in a specified format as prescribed will be required, with all required details and KYC of Karta or applicant. Also Read: What are the benefits of filing Income Tax return online? Go to the official web portal of NSDL. Select the ‘Application Type’ and the appropriate form as per applicant i.e. Form 49A for resident Indians and form 49AA for non-residential Indians and foreign nationals. Click on Submit, after re-verification of the details filled in. A token number will be generated which will be used in the further process. (Keep the screenshot of the page showing the token number if required). A new page will open on selection to fill all required details including Aadhar number, father name, mother name with an option to get the parent name printed on PAN. On clicking ‘Next’, a new page opens requiring personal details like a source of income, address, contact details. In the next window, you have to file in your area code, range code and AO number, which will all be provided in the same window. At last, it will be asked to e-Verify or upload documents along with photographs and signature. As per NSDL guidelines, an applicant has to pay a required amount as stated on the portal to complete PAN application through available payment modes. On successful payment, the page is directed to complete Aadhar authentication with OTP and as the Aadhar process gets successfully completed the department issues a 15 digit acknowledgment number for reference of application. It is necessary to submit, a copy of acknowledgment number along with the signature to the address of the NSDL department I.e. on NSDL e-Governance Infrastructure Limited, 5th Floor, Mantri Sterling, Plot No. 341, Survey No. 997/8, Model Colony, Near Deep Bungalow Chowk, Pune – 411016. Do not wait for the deadline and get your online tax return preparation done today. File your new PAN application now.